Washington, D.C. – The NG9-1-1 Institute, as part of the National 9-1-1 Education Coalition is calling upon local leaders, public safety officials and elected officials to promote 9-1-1 education in communities around the country. The month of April was first recognized by the U.S. Congress in 2008 as National 9-1-1 Education Month in support of the National 9-1-1 Education Coalition, an alliance of 8 national organizations dedicated to advancing public safety communications who joined together to advance 9-1-1 education across the country. The group is urging local events such as school outreach, street fairs featuring first responders and their equipment, and distribution of 9-1-1 educational materials throughout the month of April. 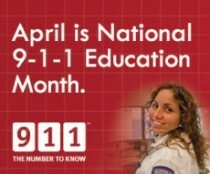 Last year, the Coalition announced the creation of www.know911.org, a website dedicated to 9-1-1 education. The site contains many free resources that can be used to promote education, awareness and outreach efforts at a local level. This year, new resources have been added to support local community efforts to execute their own 9-1-1 education outreach efforts. 9-1-1 Does Save Lives! Education should not only occur during National Education Month but throughout the entire year. This year, efforts will be placed on LOCATION: Help 9-1-1 Help You ~ Give Us Your Location. We encourage you to understand how 9-1-1 can help you and teach others to understand the critical things they should know when you call 9-1-1. The National 9-1-1 Education Coalition members each adopted resolutions in April of 2008 proclaiming APRIL as National 9-1-1 Education Month. Each year, the coalition encourages groups, clubs and organizations to put special emphasis on 9-1-1 education. The organizations of the Coalition include the Association of Public-Safety Communications Officials (APCO); CTIA – The Wireless Association®; the Industry Council for Emergency Response Technologies (iCERT), the NG9-1-1 Institute; the National Academies of Emergency Dispatch (NAED); the National Association of State 9-1-1 Administrators (NASNA); the National Emergency Number Association (NENA); and 9-1-1 For Kids®.